Magic Kingdom - Princess Fairytale Hall: You may be able to have your photo taken with Snow White and get her autograph at the Princess Fairytale Hall in the Fantasyland area of the Magic Kingdom. You'll need to check to see if she is one the princesses present during your visit. FASTPASS + is available for this experience. Included with park admission - no additional charge. PhotoPass photographers are on hand to take photos either with your camera or as part of the Memory Maker service. TIP: Because the Disney Princesses takes time with each guest, the stand-by line can experience long waits so do this the first hour the park is open or later in the evening if you do not have a FASTPASS+ reservation. Snow White and the Seven Dwarfs in the Festival of Fantasy Parade in the Magic Kingdom at Disney World. Magic Kingdom - Cinderella's Royal Table Princess Meals (breakfast, lunch, and dinner): Three or four princesses are always moving among the tables and Snow White is often included in the line-up. Other than Cinderella, Disney does not give advance announcements of which princesses will be appearing here on a particular day so do not promise your child that they will definitely dine with Snow White; just let them know that they will get to see some of the Disney princesses. Cinderella's Royal Table participates in the Disney Dining Plans - meals require two table-service credits per person. This location almost always fills so advance reservations strongly recommended; full pre-payment is required at the time you book your reservation. Epcot - Snow White Meet-and-Greet in the Germany Pavilion: Have your photo taken Snow White and get her autograph when she appears daily at various times in the Germany pavilion at Epcot. Get an Epcot Times Guide on the racks with park maps near the park entrance for exact times during your visit but a fairly typical schedule is for her to appear at 12:30, 1:30, 2:30, 3:30, 5:20 & 6:20pm for 30 - 40 minutes at a time. TIP: Because she takes time with each guest, lines move slowly. Arrive a few minutes prior to the scheduled meet-and-greet time and be ready to line up quickly to minimize waits. Cast members may cut off the line to new additions at some point in the session. Included with park admission - no extra charge. Epcot - Princess Storybook Dining at Akershus Royal Banquet Hall in the Norway Pavilion (breakfast, lunch, and dinner): Snow White often appears among the three of four princesses present at the princess meals in Epcot. The princesses are on a rotating schedule and there is no way to guarantee that Snow White will be present during your meal so avoid tears of disappointment by not promising your child that any specific princesses will be there. This is a very popular restaurant so advance reservations are strongly recommended to guarantee a table. Coming Winter 2018 - Storybook Dining at Artist Point in Disney's Wilderness Lodge resort featuring Snow White, Dopey, Grumpy and an encounter with The Queen. Diners will experience a uniquely themed pix fixe menu including shared starters, a choice of individual plated entrees, and 'sweet spells' desserts in an Enchanted Forest inspired setting with delightful music and activities. Seven Dwarfs Mine Train in Fantasyland at the Magic Kingdom in Disney World. Magic Kingdom - Snow White often appears in the opening show at the Magic Kingdom. Arrive at least 15 minutes prior to park opening (typically at 9:00AM) to see this cute show. Magic Kingdom - Seven Dwarfs Mine Train. This is the final piece of the Magic Kingdom's New Fantasyland Expansion project is now open and is drawing some of the longest lines in Magic Kingdom. Guests must be 38-inches or taller to ride. Get a FASTPASS+ reservation or head directly to this attraction as soon as the Magic Kingdom opens to minimize line time. Magic Kingdom - Snow White and the Seven Dwarfs appear in the daily Festival of Fantasy Parade in the Magic Kingdom. Magic Kingdom - There is a Snow White window display with moving parts in the Emporium on Main Street USA in the Magic Kingdom. Disney's Hollywood Studios- Fantasmic! (evening show): Snow White and Prince Charming are featured on a float in Fantasmic!, the evening spectacular at Disney's Hollywood Studios park. This is an impressive show that is offered most - but not all - evenings; check our Disney World closures and crowd warnings for the month of your vacation be sure that it is being offered on the day you visit this park. 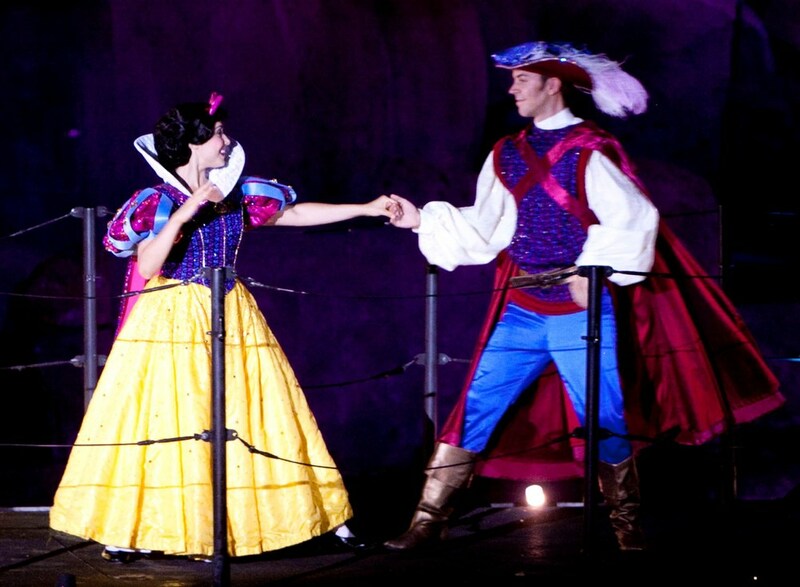 Snow White and Prince Charming dance on a float in Fantasmic! at Disney's Hollywood Studios. Snow White sculpture outside the Lego Store at Downtown Disney - Walt Disney World Resort / Florida. Our Disney-focused travel agents eat, sleep, and breathe all things Disney and will help with every detail - from resort and dining reservations to FASTPASS+ selections to theme park touring plans that keep you ahead of the crowds and out of the long lines. The best part is that we book directly through Disney and there is no charge or fee for using our services.